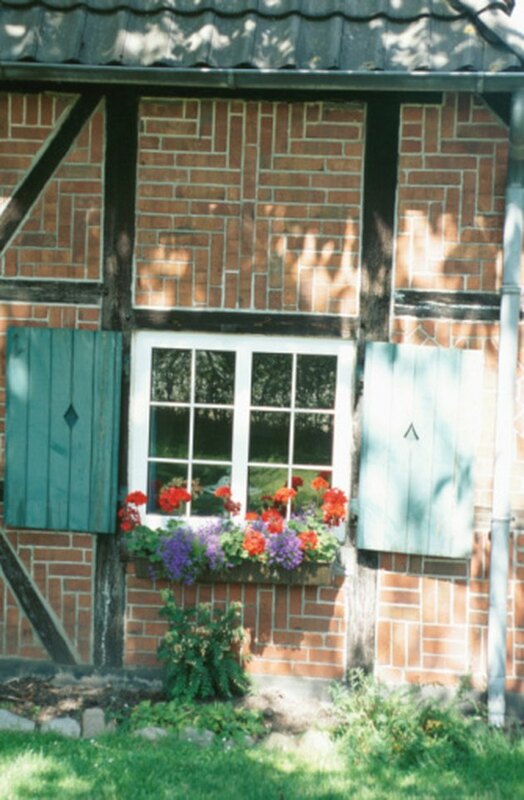 Having a home with a brick-veneer siding should not keep you from installing a window box. Mounting a box onto brick may seem impossible; however, it is an easy project requiring a few basic tools, sturdy metal brackets and masonry screws. In a matter of hours, you can add charm to the front of your home with a newly mounted box filled with brightly colored flowers. Window boxes add charm to a home. Hold the window box flush against the house just below the window casing. Use a tape measure to ensure that the box is centered under the window. Balance a carpenter's level on top of the box to ensure it is level. Use a marker pen and make reference marks on the bricks through the holes of the box at each end. Set the box aside. Drill pilot holes using a drill fitted with a masonry drill bit. If the reference marks are at mortar joints, adjust the position of the box so that you drill into brick, not mortar. Measure the length of the screws and make the hole 1/2-inch deeper than the screw's length. Blow out the holes to make them dust-free. Hold the right L-bracket behind the box and then attach this end to the brick wall with masonry screws. Use a drill with a screwdriver attachment. Attach the other end in a similar manner. Attach the bottom of the window box to the L-brackets using smaller galvanized screws. Make sure they are small enough so they do not go through the bottom of the box.